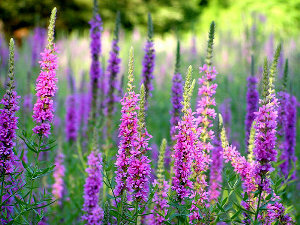 Purple loosestrife is an invasive species that grows along the edges of slow moving water bodies. The plants can grow as tall as 2 meters with 30-50 stems. A mature plant can produce as many as 2 million seeds annually. An effective control solution for purple loosestrife is to use a Glyphosate 5.4 herbicide and a surfactant. When sprayed all over the plant, the Open Water kit will be absorbed and kill the roots of the plant.